No matter how well you have trained your parrot to talk to you, it cannot tell you when it is not feeling well. As your avian companion’s human caretaker, it is up to your observations to determine if your bird is undergoing health issues. Birds will instinctively hide their ailments, as in the wild they would mark the animal as easy prey. This desire to conceal illness makes your health monitoring very difficult. By the time noticeable behavioral changes are apparent, your bird may be very ill. Similarly, dull feathers may become evident to you after your bird is already seriously ill and in need of attention. How Do I Check My Parrot’s Poop? What Constitutes Healthy Parrot Poop? What Signifies Problems With My Parrot’s Droppings? Why Should I Monitor My Parrot’s Poop? One method you can take to monitor your bird’s health on a daily basis is by examining its droppings. Your parrot’s poop is a window into its health. You will have ample opportunity to examine your bird’s droppings during the course of the day. According to petcha.com, the number of times your bird poops per day is inversely proportionate to its size. Small birds like parakeets may do it 40 times a day where larger birds like macaws may only leave dropping 15 times per day. If you are monitoring your parrot’s droppings it is best done shortly after they leave them in the bottom of their cage. Over time, the droppings dry and will all tend to look black, negating any usable information that can be gleaned from observing the color. The best material to use for your cage bottom is newspaper. By using several layers of newspaper, you can remove one daily and monitor your bird’s droppings while also moving uneaten food, dust, and moisture that can lead to potential health risks. When using wood chips or shavings you will not be able to get the same view of your bird’s poop for proper observation. Your bird’s droppings should be fairly consistent on a day to day basis. In the morning there may be a very large dropping deposited as the bird’s digestive system wakes up. Throughout the day, your parrot will do its business regularly based on its size and food and water intake. In the video below you can see what the droppings of some different species should look like. Healthy bird droppings are odorless. The liquid urine should be clear in a healthy parrot. The urates appear chalky and white or cream colored. Feces are firm and will be colored based on your bird’s diet. If the staple diet consists mainly of seeds then the feces will be dark green. If it’s composed of pellets the feces will take on the color of the pellets. As it dries, all feces tend to look black, so for the most accurate reading, you want to be viewing a recently deposited sample. Additionally, your bird’s most recent meals will make a substantial difference in their droppings. Blueberries, pomegranates, beets and other highly colored foods may alter the color of the droppings but not signal any problems. Fruit and vegetables with high water content will also result in more urine being produced, and should not be cause for alarm. So you really need to be monitoring what goes in, and what comes out of your parrot to get the full picture. Some signs that your bird may not be feeling well are if its poop is discolored. An increase in output, as well as excess moisture in the droppings, are also a sign that things are not right. Any odor associated with the droppings is abnormal and should be a cue that further investigation into your parrot’s health is warranted. 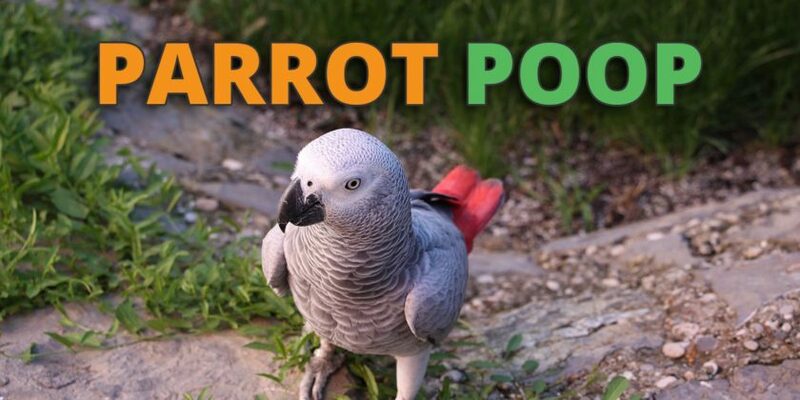 In particular, we will list some of the abnormalities in the various components of your parrot’s poop, as reported by beautyofbirds.com. Some of these issues may signify serious problems that need to immediately be addressed, while others can be dealt with by modifying your bird’s diet. Internal bleeding that is occurring low in the digestive tract can indicate lead poisoning or kidney disease. Excessive drinking may indicate a bacterial disease. Can indicate liver disease or anorexia. Kidney disease or fresh internal bleeding. Dehydration and possible kidney problems. Indicates an internal injury with bleeding high in the digestive tract. Possible ingestion of an object causing an internal injury. Problems with the pancreas or other digestive organs. Simply put, this is one of the easiest and most effective ways of keeping tabs on your parrot’s health. Being familiar with your bird’s behavior and physical characteristics and watching for changes is also recommended. The daily paper change you will be performing to monitor your bird’s dropping will give you an opportunity to head off some potentially serious health problems while also keeping the cage area cleaner and bacteria free. This video below shows the importance of monitoring droppings as one factor in evaluating the health of a parakeet.